As the weather cools down, life outside becomes more attractive for families and businesses. Hutcheson Horticultural Company has had the pleasure of helping families and individuals enjoy outdoor space with the installation of landscape and hardscape elements. With the cooling weather, we tend to note an increase in the interest of outdoor fire pits. Roasted marshmallows, backyard campouts, ghost stories, and flashlight tag are all great ways to make memories in the backyard. 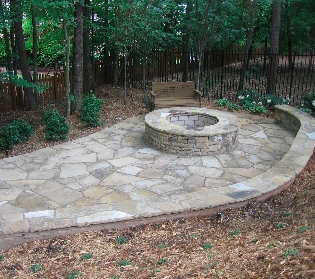 A hardscaped fire pit allows for fun and festive backdrop for these memories, as well as a great place to share in making s’mores and roasting hot dogs over the fire. Contact Hutcheson today to get a free quote on a custom backyard fire pit for family memories to be captured around for years to come. Not only are fire pits a great place for families to make memories together, but they also provide a fun and enjoyable backdrop for entertaining. Whether you are hosting a neighborhood BBQ, welcoming friends from church, or entertaining co-workers, a fire pit provides a great place for people to gather. Contact Hutcheson for a backyard fire pit that will provide everything you need to make your outdoor entertaining extraordinary. Hutcheson Horticultural Company has been serving Woodstock, GA and the surrounding communities for over 25 years. Take a look at our projects for examples of our work and imagine your backyard with a hardscaped fire pit that will provide years of enjoyment and relaxation.